Diane Lewis is a partner of The Lewis Team, LLC, and an Associate Broker at Washington Fine Properties, located in McLean, Virginia. She has a passion and dedication to real estate that began over twenty years ago and is a licensed Broker in Virginia, Maryland, and DC. Her commitment to top-notch service and sales is consistently recognized in Washingtonian Magazine�s exclusive list of Top-Producing Agents. Diane grew up in McLean, Virginia and graduated from Virginia Tech. She currently lives in N. Arlington and enjoys playing tennis and golf. 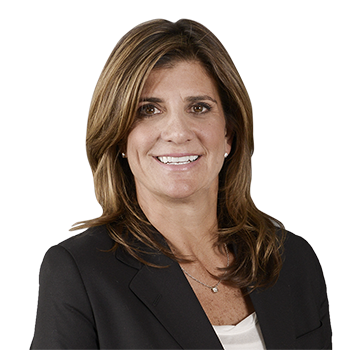 Before selling real estate, Diane worked for the United States Professional Tennis Registry in Hilton Head, South Carolina, where she specialized in sports marketing and membership services. Her love of tennis carries on as she is an active member of the tennis committee at Washington Golf & Country Club. Diane was our listing agent for our home in Arlington. She was superb. Professional, highly knowledgeable about the local market, very responsive, and proactive. And just a fun, nice person. Thanks to Diane, we sold our house very quickly and with a minimum of stress. We can't recommend her highly enough. This letter is written to recognize and recommend the outstanding service, professionalism, and most importantly, the expertise of Diane Lewis as a real estate professional. My home-building company has been working with Diane for the past 15 years. She has not only helped us with the sale of many new homes over the years, but most recently, helped my wife and me sell our own home. There are many qualified and successful agents in the Northern Virginia area, and I recognize the differences between excellent, average, and mediocre performance. Without a doubt, Diane is the very best of them. She has demonstrated excellent market knowledge, an amazing work ethic, and genuine personal and professional integrity. She is very personable and communicates exceptionally well, and is always available to quickly respond to questions, whether in person, via mobile phone, or e-mail. I highly recommend Diane for your consideration as your real estate agent. She is a great listener and will work extremely hard to meet your expectations. Whether a buyer or seller, I highly recommend Diane Lewis for any of your real estate needs. Diane listed our Oakton home in March, and the listing was all over social media within hours. From our initial meeting to the pricing tour through contract negotiations, Diane was reliable and dependable. Diane has a phenomenal network and works proactively, which is crucial in this market. Diane�s superior communication skills and demeanor were appreciated throughout the entire process. Diane provided us feedback as it was provided and did so in the most professional manner. We always felt we were Diane�s main priority, and her patience is second to none. Our home was shown by appointment only, which Diane always respected and gave us ample time to make the home available. When multiple contracts were presented, Diane�s precision in each of their pros and cons was paramount. Coming from a self-proclaimed anxious Seller, I assure you working with Diane provided peace of mind from beginning to end. We trust, respect and admire Diane Lewis, and anyone else that may work with Diane will feel the same. Diane Lewis and her team communicate effectively and quickly and can be trusted to tell you the truth, whether it's in their best interests or not. Their marketing approach is more comprehensive than that of other firms I've seen, and they will see you through from listing to closing with attention to details you'd rather not even know about. I've now closed 7 real estate transactions with Diane over the years and at different firms, and her current team at WFP is great. The Lewis Team is simply the best! From their expert guidance and knowledge of the market to their responsiveness and attention to detail, I cannot recommend them highly enough. They guided us through the home selling/buying process with ease as well as through some tricky issues that came. We could not have done it without them. Her representation of my property was first-class, and I was truly impressed with her follow-up with prospective buyers and agents, and her communications with me during the process. I consider The Lewis Team to be the best agents in Northern Virginia. They are calm, careful, extremely knowledgeable, and have a keen eye and understanding of value that makes them the best. Buying or selling homes is trying and stressful, and The Lewis Team saves you far more than the broker fee in my experience. When it gets down to the most crucial moments, and it always does get that way, they are the counselor you want and need. I've done two deals with them in the last few years, both very successful. I know almost every agent in the area from extensive interaction at open houses across the region, and I wouldn't work with anyone else. Ask any agent in town and they all know and like The Lewis Team, and they like to work with them because they are so nice and such professionals, and that helps too in any deal. The Lewis Team is the best and I highly recommend them. As a commercial real estate professional I hold my standards extremely high for anyone that I hire in the space. The Lewis Team's expertise in the DC metro is better than anyone that I have come across, and they are definitely who you want representing you. Better yet they have awesome personalities, and you will definitely have new friends at the end of the process. Look no further. The Lewis Team and her team of professionals handled our short-notice, cross-country move flawlessly. By the end of day three, we were under contract! The Lewis Team always responded back to our questions/Comments immediately and greatly simplified our home purchase process.